Although a pool adds a splash of fun and excitement to your outdoor space, it is necessary to keep a watch on your kids and pets to prevent them from making unsupervised trips to your pools. Inadequate pool fencing is a major factor behind accidental drowning. Swimming pool fences installed around pools create a passive barrier that restrict the access of small kids to water. Therefore, at Kid Safe Pool Fencing, we provide premium quality products and installation services of pool fencing in Melbourne. Our pool fences in Melbourne are designed to cater to the requirements of both commercial as well as residential properties. Pool fencing is not boring any more. Apart from safeguarding your kids and pets from water, our fences are available in various contemporary designs that enhance the overall appeal of your space. We have a wide array of exciting designs, which can be modified according to your needs. A large number of deaths due to drowning in pools are generally caused by faulty fencing that is non-compliant with the Australian Pool Fencing Standards. Therefore, it is extremely important to choose a pool fence installation service provider who abide by the Australian Standards. We ensure that all our products and services meet the legal responsibilities, in order to ensure complete safety of your pool side area. Being in the industry for over two decades now, we have ensured that all our services are completely in compliance with the Australian Standard for Pool Fencing. 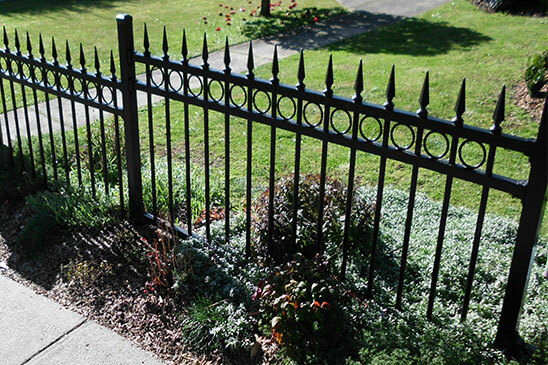 In order to achieve customer satisfaction, we have been using only premium quality steel fencing materials. Our pool fencing supplies are made from some of the best quality steel fencing materials and our professionals will build finest quality steel fencing around your pool. We ensure that, all the products from Kid Safe Pool Fencing, including locks and latches, are steadfast to ensure that your family can have maximum fun at the poolside, without compromising on the safety. Being in compliance with the National Australian Safety Standards, our fencing materials are made from high-quality galvanized steel. Furthermore, our powder coated steel fencing supplies are designed to withstand the test of time. Apart from security fencing in Melbourne, we also provide swimming pool fencing in Melbourne. Get your free quote now, by calling us at 1300 840 095. Our professionals would be happy to assist you. Alternatively, you can post your queries online. We will ensure that all your queries will be addressed.